Hirotake Arai, the founder of Arai Helmet, Limited was born in Tokyo as the eldest son of Yuichiroh Arai who manufactured the hats for government office and authorities. Hirotake Arai established the factory in the city of Ohmiya, Saitama and started manufacturing business for headgears. Current president, Michio Arai was born as the eldest son in Tokyo. Arai Sewing Company was established to manufacture T-shirts and blouses for export. Manufacturing headgear started with the construction of workers’ helmets. Hirotake Arai developed manufacturing helmet shells by heat forming with resins. Arai Hirotake Shoten, Co., Limited was established in Ohmiya, Saitama. Hirotake Arai began manufacturing first FRP (“Fibre Reinforced Plastics”) helmets in Japan. Arai Hirotake Shoten, Co., Limited became licensee of Japan Industrial Standards (JIS) for construction workers’ helmets as the first manufacturer in the helmet industries. Arai Hirotake Shoten, Co., Limited started supply of headgears to professional off-road motorcycle racers as the first Japanese “motorcycle helmets”. Arai Hirotake Shoten, Co., Limited started production with the new trademark “HA” (HA came form the initials of the president’s name Hirotake Arai). HA started production of motorcycle helmets consisting of FRP outer shell and EPS inner shell that is still common standard for helmet construction today. Hirotake Arai established “bag moulding” for manufacturing FRP shell with 2-piece, open-close, metal moulds, and the first open face helmet was designed and made with this manufacturing method. Michio Arai came back from the United States and joined Arai Hirotake Shoten, Co. helping his father’s business in the export division. HA produced the first Snell certified Japanese helmet. HA started export business for the United States’ market through USA distributors. HA became licensee of Japan Industrial Standards (JIS) for motorcycle helmets. Model R-6M was certified to Snell 1968 standard. First Japanese made full face model was introduced. New trademark, “Arai” was designed and registered. Introduction of the movable chin piece. “Arai Hirotake Shoten, Co. Limited” changed to “Arai Hirotake, Co., Limited”. Akihito Arai, son of current president Michio Arai, is born. 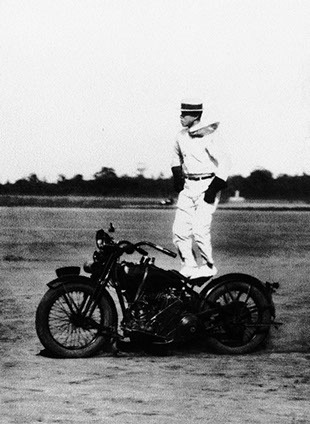 Arai started motorcycle-racing support with a few Japanese professional motorcycle racers. Arai Helmet (USA), Limited was established. Japanese emperor conferred decoration upon Hirotake Arai. First helmet model for exclusive off-road riding was introduced. One-touch, open-close face shield mechanism was developed and introduced on the market. Basic construction of this machanism became common in helmet industries later. Arai Helmet (Europe) B.V. is established at Hoevelaken, The Netherlands. Freddie Spencer won the World GP 500cc Road Race Championship as the first World Champion with Arai. Arai Racing Service introduced. Arai starts sponsorship of Formula One drivers (Keke Rosberg). Introduction of the eyebrow ventilation in the visor. Company founder Hirotake Arai passes away and Michio Arai takes over his father’s company as the President of Arai. Current company organisation was established, and its name was changed from “Arai Hirotake, Limited” to “Arai Helmet, Limited”. 26 out of the 28 Formula One drivers wear Arai. Arai introduces AdSis (Advanced Shield Instalation System) at the German Cologne show, being the first to offer visor change without the need for tools. First, of annual recurring, Arai Importers Meeting. Patented Super AdSis (SAL visor system) was applied as further developed version of AdSis. As the first helmet manufacturer Arai introduced a full 5-Year Limited Warranty. New premises of Arai Europe opened. Introduction of the RX-7 model. First model with the Diffuser ventilation system. This model set a new benchmark in motorcycle helmets. Arai ranks highest in the first J.D. Power and Associates U.S. Motorcycle Helmet Satisfaction Study. Introduction of the limited edition Chikara model honouring 20-Years anniversary of Arai Helmet (Europe) B.V.. Introduction of the Removal Assist Hood. Carbon fibre helmets mandatory in Formula One. Arai introduces its first carbon fibre helmet at Magny Cours: the GP-5 RacingCarbon (only available for Formula One drivers). Opening of the Arai Inspiration Centre (AIC), Hoevelaken, The Netherlands. Patented PB-SNC® Construction developed for the special Formula One helmets. I ntroduction of the VX-3 off-road helmet. First helmet with the Emergency Release System. 25 Years Anniversary of Arai Helmet (Europe) B.V.. Akihito Arai and Ingmar Stroeven appointed as managing directors of Arai Helmet (Europe) B.V..
Introduction of Arai’s first carbon fibre car helmet model for commercial use: GP-6 RacingCarbon. Introduction of the new benchmark helmet model in motorcycling: RX-7 GP. First motorcycle model with the wide view SAI visor and the Patented PB-SNC® Construction. As first manufacturer Arai introduced the Max Vision visor on the market. More than 50% of the Formula One grid and 30% of the MotoGP riders use Arai. Introduction of Arai’s first carbon fibre motorcycle helmet model for commercial use: RX-7 RacingCarbon. For the 13th consecutive year Arai ranks number 1 in the J.D. Power and Associates U.S. Motorcycle Helmet Satisfaction Study. Arai introduces the Quantum with factory fitted SAI Max Vision visor with brow vents.